Are we a world that is facing better or worse? I have had many fits of anger in my life. Some have been anger toward family members and friends. Others have been fits of anger toward coworkers. Some have been simply been anger toward momentary circumstances. Not once during any of these angry moments did physical harm, shooting, stabbing or killing someone enter my mind. It seems like lately that not a day goes by that we don’t hear about killings happening somewhere in the country. Just today, at least 8 people were shot outside of the Empire State Building and the alleged cause is a dispute between coworkers. How do people carry so much anger and hatred in themselves that they are able to take the lives of others? Human life (in my opinion) is the most precious thing on earth and to just rip it away from someone just seems so animalistic to me. I will always be a person that will feel the beauty that surrounds me. I will love the moments of goodness that I am able to witness and appreciate people for their kindness but the reality of the world is that it is becoming a very violent and angry place….too violent and angry. I was home with my roommate last night and he had a documentary on about “gangster” rappers and everything discussed was about gangs and killing one another. Too many people live in areas (and grow up to believe) where taking another life is the way of the world….murder has become a normal thing. If someone were to speak offensive words about you or someone you know, gunfire may be the answer to “solve the problem”. How did we get to that place? I hate writing about negative issues in the world but they are issues that must be faced if we want to see any changes. I feel like the world/government has used the same tactics to make changes in the world and all we have witnessed is problems getting worse. Violence will NEVER solve anything…I don’t care what anyone says. It is simply going to piss more people off and teach others to make the wrong decisions. I don’t know if we are too deep in the hole to come back out but I truly believe we need to start focusing more on family and relationships and the value of the individual. I believe we have so much anger and so much violence because people are unable to express themselves and people are not hearing of their value. No, I do not believe in stroking people’s egos but I do believe in reassuring people of all of their goodness and their values (we all need that sometimes). We need to teach people of ALL ages about compassion and doing for others and steering away from a self-centered way of life. People can call me naïve if they wish but obviously the ways we are trying to solve the problems of the world now are not working. Our government has become nothing but a competition of egos….a real government should be made up of the most selfless people in the nation (at least in my opinion). Elections have become nothing more than popularity contests (not for all but for far too many). In my life experiences, I have found that people that have encouraged me have made a much bigger (and positive) impact on my life than those that decided for me and barked out orders and commands. Life has become this competition for power status and regardless of anyone’s title, we are all still human beings….we are all equals. I have worked with young children and youth and it could be very easy to just shake them and tell them how to think and how to act but where would that ever get me? It would only cause resentment from both parties and the loss of individuality on the part of the youth. In life I want to teach people (young and old) but I also want them to draw their own conclusions from those teachings. I believe that government takes away individuality so very much….it takes away the voices of the people that make up this great nation. Through all of the violence and criminal acts that are occurring in the world, there is still so much potential for greatness. As strange as it sounds, I think of the words of Martin Luther King a lot and I admire his selfless courage…he saw so much potential in this great nation and he used his voice to support unity instead of division. Our government is dividing us and as a country called the UNITED States, we should not be fighting and hating each other…at least that is what I think. I do understand that even if there were only 2 people in the world that there would be an argument at some point or another BUT I see no good coming out of two presidential nominees pointing fingers at each other and speaking nothing but negatively about each other’s beliefs systems. What kind of role models are these “leaders” being to our young people. It truly sickens me to my core. We can fight for what we believe in but the fighting does not need to include ugly words, hatred or violence. The fight can be proactive instead of reactive. I think about the evolution of humans so much and what life was like before my time. I asked a lot of questions of those that are older than me to get an idea. From the knowledge I have gained, we have evolved in so many areas (technology, media, etc) but has far as humanity, it seems that there has been this drastic decline. I just wonder why the decline happened at such a rapid pace? I know there are probably a million reasons but it seems like overnight we have become a nation of self-centered, entitled people. I fear that if we don’t start taking ownership and making changes that the problems we have now will look minor in comparison to what they will be like 10 years from now. I totally understand where you are coming from in this great post. To keep my self sane I subscribe to the principal of eighty percent of the news is about the twenty percent of negativity in the world. The eighty percent of good things happening in the world only gets twenty percent of news. 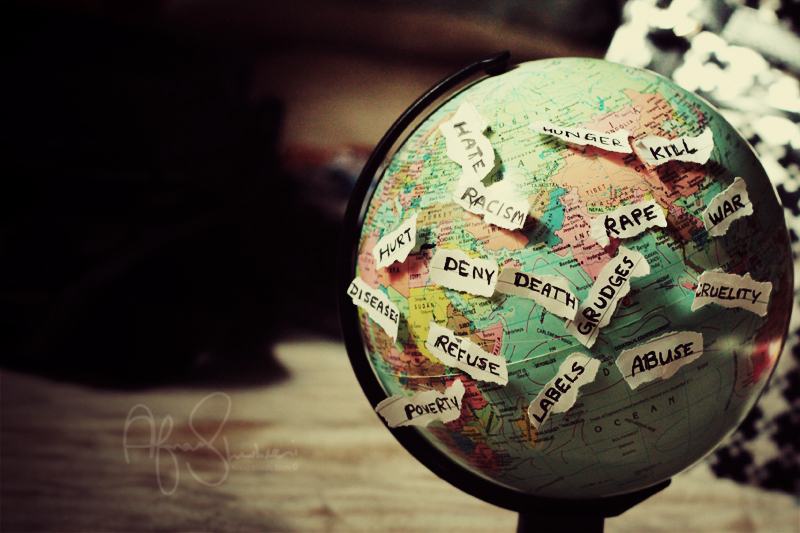 Hence the world appears a horrible place to be, when it isn’t.